Finally, Mother Nature gave us a break from the wintery grey sky and has started flirting with summer this weekend. London put on its sunglasses (an essential accessory after a late Saturday night on the town), and a pair of flip flops, and headed to a crowded Brick Lane. It was the degree show weekend for Goldsmith BA Design students, taking place at the Old Truman Brewery in the trendy East End. One of the students that stole the show was Amanda Took, an exhibiting Goldsmiths BA Design student. She explained her concept to the viewers, signing them up to her false travel agency, intriguing and charming passer-bys with her idea. Amanda describes herself as being an anxiously ”‘ill-travelled” person. In times like these, society honours well-travelled individuals and merits them ‘’interesting”. Amanda has designed a web platform, which takes the shape of a travelling experience and allows you to immerse yourself within a foreign culture, gain social credit (asset) and values – all without having to pack any luggage. 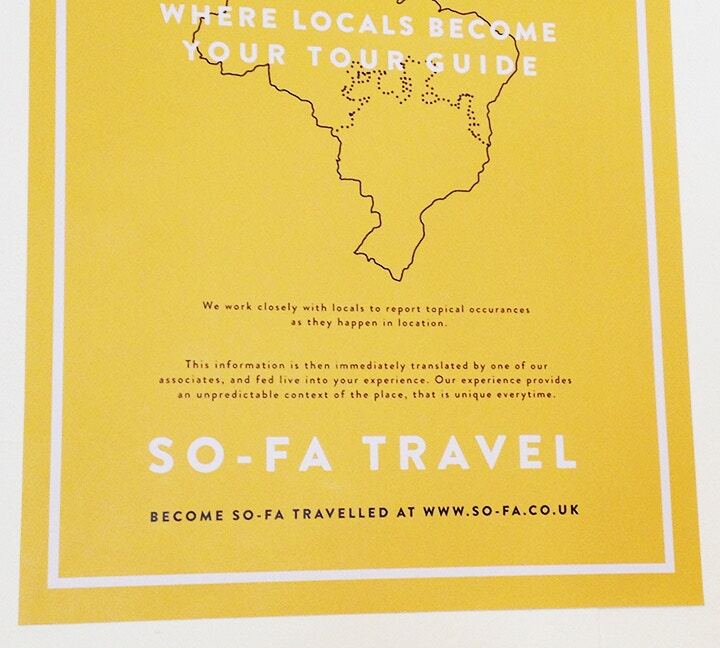 It is a SO-FA Travel Agency. Just imagine: we can do almost everything via the Internet: shop, bank, watch TV, read books, receive personal training, coaching and even undergo counselling sessions. And now, with Amanda’s vision, we could soon be travelling the world from the comfort of our own sofas. We can be seen to be increasing our knowledge and perception of cultural capitals, without really going anywhere. Is this the future? 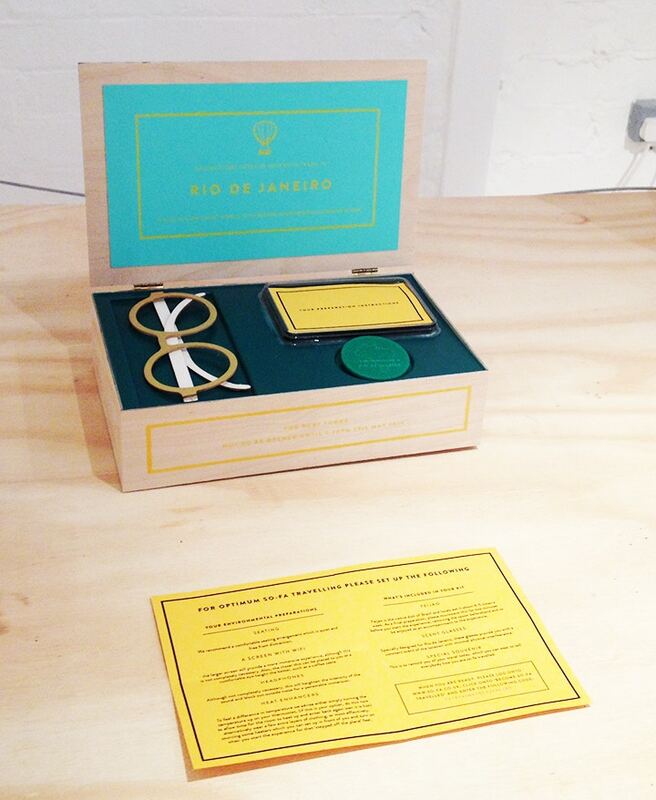 Or purely a playful and ironic experience, orchestrated by a young designer? Amanda has tried to respond to the stereotypical idea of having ‘life changing experiences through travel” followed by the need to tweet all about it. Amanda’s amusing yet serious work quotes J.G. Ballard in the press release. Amanda Took raises the important question: Can we “find ourselves” from our own armchairs? Who can say? But the sheer fun of going to Rio de Janeiro courtesy of an indoor sofa, facing an electric heater, boosted to the max, on a hot afternoon in East London is no less something to be experienced. Never mind the wealth of talent from other exhibiting Goldsmiths students, Amanda's unique concept is just one example of the creativity brimming out of the Goldsmiths design show this year. View the dates and times of all the Goldsmiths interdisciplinary degree shows here.